This page is a place to share stories about people who are making a difference. 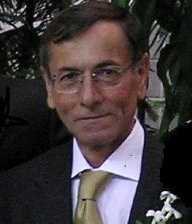 The Romano Memorial Fund was set up to celebrate the spirit of Umberto Romano (1954 -- 2008), husband of LemonAid Fund Founder Nancy Peddle and staunch supporter of LemonAid Fund's mission. Umberto believed that he could make a difference in this world through LemonAid Fund and his last wish was the desire to continue building LemonAid Fund so it could help to change the lives of those he so cared about; those whose lives were filled with injustice and violence and yet still had hope and a willingness to implement change. Thank you for your generosity and for allowing Umberto to leave a wonderful legacy. Luc first came to Sierra Leone in 2008 as the IT volunteer with World Computer Exchange. He helped set up over 100 computers and visited many programs including LemonAid Fund and Mission4Salone. He fell in love with the county and became a champion. Here is his story in his own words: "When I went to Sierra Leone in 2007, I visited an orphanage and noticed the children finding pleasure and comfort in such small things as singing, dancing, and soccer with an old flip-flop. Support from a few incredible people who provided some basic needs such as two meals a day and water and shelter made it possible. I realized putting smiles on so many faces is not so hard and can make the world a better place, 1,000 kids at a time. I am privileged and humbled to be working with people like Pastor Peter Kainwo, Mrs. Francess Browne and Dr. Nancy Peddle, bringing joy to so many people. It's an incredibly rewarding and satisfying to see and experience. 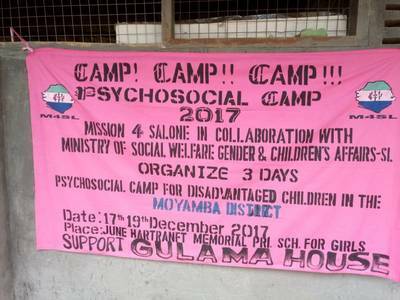 I am committed to raising the funds for Mission4Salone's annual psychosocial children's camp." 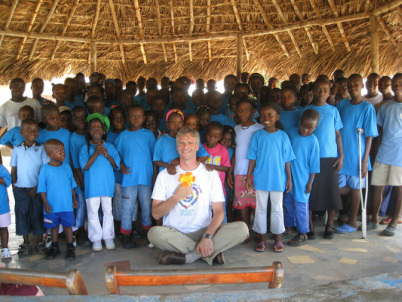 ​Luc raises over $3000 through LemonAid Fund yearly to support Mission4Salone's psychosocial camp for over 1,000 children. 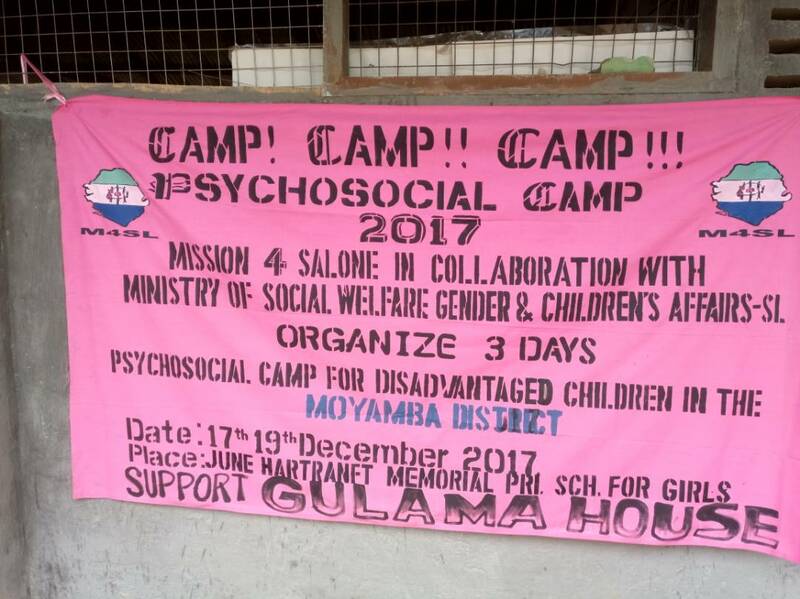 In 2017 the camp was held in Moyamba Town. On participant said, "Since day one of the camp I felt lively mainly because I made new friends." She was the type of person who had in the past reacted very violently at others comments against her, but at camp she learnt to forgive those who speak evil about her and to move on. 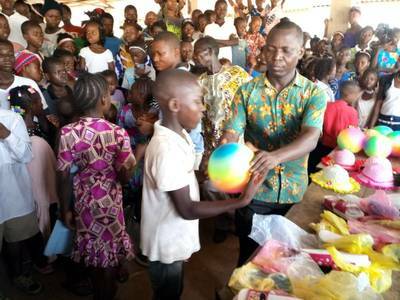 She went on to expressed her thanks and appreciation to Uncle Lucas, Dr. Nancy and the entire staffs of the Mission for Sierra Leone and LemonAid Fund for their support and appealed to them to do more in other communities. She believes that the camp could help other children to be bold so they can talk to others and make friends. 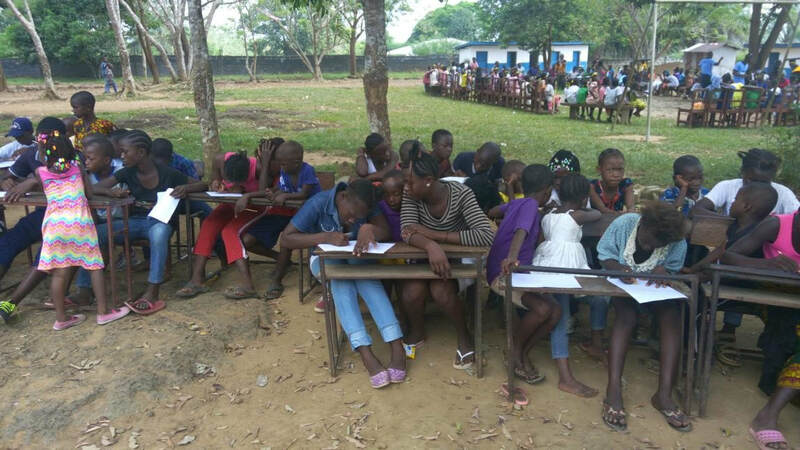 Additionally, the camp is good because most of the children do not have the opportunity to eat three times a day and during the camp they receive food three times a day. Besides the children being grateful, the Moyamba community was so moved that they sent massages of thanks and appreciation. They also wanted to know when the next Camp would be held in Moyamba Town. Marlene Cohen, EdD., BCBA-D is the founder of Possibilities Consulting, LLC and has taught at The Chicago School of Professional Psychology, Rowan University and Rutgers University. She is currently the Director of the Virtual Academy for Overcoming Global Poverty. Recently, Dr. Cohen has received grants to provide technology training to teachers in South Africa and Colombia. Dr. Cohen received her doctorate in Educational Leadership from Nova Southeastern University and is a Board Certified Behavior Analyst at the doctoral level. Dr. Cohen has over 35 years of experience in the field of autism and developmental disabilities in private, university and public settings. She has also worked with individuals with ADHD and other learning disabilities. Dr. Cohen has presented both nationally and internationally at conferences on a variety of Applied Behavior Analysis topics. She is a co-founder and the first President of the New Jersey Association for Behavior Analysis. David Tormo-Sanchez is a bilingual elementary teacher from Spain, with has over 10 years teaching experience in Illinois Public Schools, and has been volunteering over several years in Medellin and Popayan, Colombia. He holds a degree in Curriculum and Instruction with an ELL/Bilingual endorsement from Concordia University Chicago. Through his volunteering in Popayan, he has made connections with city officials and has spent numerous hours visiting and observing the conditions in Popayan schools.